Darlington is a County Durham town in the north east of England and has a population of just over 100,000 people. A market town, it houses some of the larger service companies in the country and some important engineering works. 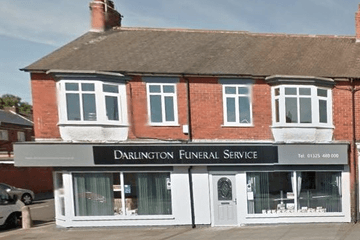 There are seven funeral directors in Darlington, all of which can be found within a five-mile radius of the centre of town. The borough council runs three cemeteries in the town itself, called the North, East and West cemeteries. Of these, the West is the largest, which contains an area set aside for the Jewish faith. North Cemetery caters for Muslims as well as other religions. The Darlington crematorium is the fifth ever to open in England, established in 1901. It is to be found within the grounds of the West Cemetery and provides two gardens of remembrance and a chapel which caters for religious and Humanist or non-denominational services. Local funeral directors in Darlington will be able to advise on the availability of cemeteries, churches and other services for your loved one’s farewell. There are a selection of places of worship, including a Sikh gurdwara, Buddhist centre and mosque as well as many historic Christian churches. Search for local Darlington funeral directors now to see funeral homes near you. You can filter search results by best rated, most reviewed or nearest to you. Click on a funeral director’s listing to see their profile page, where you can read independent customer reviews, search for recent obituaries, and learn more about the funeral services they can offer to you. Fantastic service and lovely people. Had no issues at all and would highly recommend. Offered great flexibility and really went above and beyond what i was expecting during such a difficult time. I very quickly knew i had made the right decision in choosing them! I can't thank Keith and Jen enough for the help and support they have given me and my family during our tragic time of not only losing our Mother but our Step Father too. Nothing was too much trouble for them even urging us to pick up the phone no matter what time; day or night if there was anything troubling us. The chapel of rest was the most lovely peaceful room and we were happy to have our parents rest there before the funeral. Keith made sure everything we'd asked for after the funeral was brought back and passed on to us. Keith and Jen took a lot of the worry and stress out of what was already a difficult time, even helping us with the obituary which helped us a lot as we'd never been through anything similar before. As a family we will be sure to let everyone know how wonderful they were and will recommend Saint and Forster to anyone who has a difficult time to come. Thank you so much Keith and Jen . Firstly, you’ve misspelled the name of the deceased. Not a good start. However the attention to detail and their care and kindness could not be bettered. Can confidently recommend them. From our very first conversation, and throughout the arrangements made for my brother Paul's funeral, I found Saint and Forster to be extremely helpful and sensitive. They were very informative, empathetic and were consumate professionals, keen to ensure a high quality and bespoke service. I would have no hesitation in recommending these funeral directors and am very grateful for all their kind help and assistance during this difficult, upsetting time. Thank you for your kindness and support. Much appreciated! Sensitive and professional service. Keith conducted himself with a great deal of compassion making a very unpleasant situation more bearable. Thank you.